The two sides debated regional and global issues, as well as the development in the Vietnam-France relationship, with the highlight being the celebrations for the 45th anniversary of diplomatic ties and five years of the strategic partnership in 2018. The two sides reaffirmed the central role played by the UN in maintaining peace and international security, and promoting prosperity and sustainable development as well as their respect for the UN Charter and commitment to respecting the independence, sovereignty, territorial integrity and political mechanisms of each other. They agreed to promote the development of a multi-polar world and multilateralism based on mutual respect, equality, fairness and cooperation in the spirit of mutual benefits. The two sides emphasised the importance to promote and protect human rights and basic liberties in line with the UN Charter, and international commitments that they have joined, for the development of each country. Vietnam and France repeated their respect for the objectives and principles UN agencies pursue, including UNESCO. The two sides asserted their commitment to facilitating liberalisation of trade and investment, and their respect for the role of the World Trade Organisation and expressed their hope for enhanced cooperation to improve global administration mechanisms. They stressed that terrorism is one of the most serious challenges against peace and security and that all terrorist acts are crimes and cannot be exculpated. They expressed their support for efforts made by the international community to fight terrorism. They supported the efforts towards upgrading the ASEAN-EU Relations to a strategic partnership and encouraged the EU’s increasing participation in strategic architectures led by ASEAN. They hoped the free trade agreement (FTA) between Vietnam and the EU will be signed and approved in 2018, and it will take effect soon. The two sides agreed that the Vietnam-EU FTA and the Framework Agreement on Comprehensive Partnership and Cooperation (PCA) will deepen current dialogue mechanisms. They stressed the FTA will help promote relations between France and the EU with the ASEAN members. They agreed to foster the Vietnam-EU partnership in terms of politics and security. Vietnam and France want to boost cooperation and dialogues, thus contributing to enhancing connectivity in Southeast Asia, facilitating links between Europe and Asia and promoting sustainable and inclusive economic growth. They applauded activities to foster connectivity within the Asia-Europe Meeting (ASEM) and emphasised the importance of developing economic projects based on fair competition, transparency and economic sustainability. The two sides hailed the role played by ASEAN in peacefully promoting international maritime cooperation, while stressing the importance of respecting the 1982 UN Convention on the Law of the Sea 1982, resolving disputes by peaceful measures and maintaining security, aviation and navigation freedom in all waters and oceans with respect for international law. They said they support efforts of ASEAN and China in implementing the Declaration on the Conduct of Parties in the East Sea and hoped for the completion of a practical and international law-complied Code of Conduct in the East Sea. The two sides reaffirmed their desire for the denuclearisation of the Korean Peninsula while calling for the full implementation of resolutions of the UN Security Council related to the Democratic People’s Republic of Korea. They also asserted their support for a diplomatic process to promote the complete denuclearisation of the Korean Peninsula, affirming that Vietnam and France will make every effort to protect international regulations on nuclear non-proliferation on the basis of the Nuclear Non-Proliferation Treaty. The two sides welcomed the development of bilateral relations over the past 45 years, and affirmed their wish to develop their cooperation in all fields of the Vietnam – France strategic partnership signed in 2013. They reiterated their determination to increase cooperation in politics, diplomacy, defence, security, economics, trade, investment, climate change adaption, sustainable development, science and technology, education – training, Francophone issues, law and judiciary, health care, locality cooperation, people-to-people exchange, culture and tourism. The two leaders agreed to increase exchanges and high-level contacts. They welcomed the Party chief’s visit to France and the meetings and bilateral exchanges in 2018, as well as the outcomes of the annual high level economic dialogue, and the national defence policy dialogue in January. They agreed to maintain regular bilateral mechanisms and expand consultation mechanisms, including the deputy ministerial-level foreign affairs and defence strategic dialogues between the two nations. The two sides also welcomed the strengthening of parliamentary cooperation between the two nations. The two leaders affirmed their wish to deepen defence cooperation, with a focus on strategic dialogues, officer training, particularly in French-language teaching, and peacekeeping activities. They pledged to forge cooperation in defence equipment, boost exchanges over maritime and aviation security and military medicine. They welcomed visits and technical stop-bys of French warships to Vietnam and the signing of a letter of Intent on the signing of a Declaration on Joint Vision on Defense Cooperation from 2018 to 2020 as well as the extension of agreements in hydrography, oceanography and sea mapping. They pledged to boost the effective implementation of bilateral agreements on extradition and judicial assistance, addressing organised crimes for regional and international security. They showed their determination to foster cooperation in economics, trade-investment, and long-term partnerships in industry, particularly in infrastructure, transport, energy and space. They praised the cooperation in aviation, reflected in the new contracts signed between Tre Viet airline and Airbus and Vietnam Airlines and Air France. They also supported measures to accelerate the pilot urban railway in Hanoi, running from Nhon to Hanoi railway station. They wanted to boost cooperation in agriculture and sustainable fishing, with respect to international norms agreed to by Vietnam and France, particularly in natural disaster prevention and control, climate change adaption and biological farming. They also underlined the significance of the Vietnam-targeted projects of the Centre for International Cooperation in Agricultural Research for Development of France. Vietnam welcomed the “One Planet” Summit in Paris in December 2017, in which Vietnam participated, while the French side welcomed Vietnam’s plan for implementing the Paris Agreement on climate change from 2016 – 2030. They agreed that the Talanoa dialogue is a proper measure to evaluate climate targets to realise the goals of the Paris Agreement. They also supported the negotiations at the International Maritime Organisation and the International Civil Aviation Organisation to reduce greenhouse gas emissions from civil aviation and shipping. Vietnam and France wanted to continue their dialogues on building a global environment convention, and reaffirmed their determination to effectively implement the Agenda 2030 for Sustainable Development. They also acknowledged the key role of cities and territories in adapting to climate change and pledged to exchange specialists to more effectively use resources and to ensure sustainable and adequate urban services, particularly in transport, housing, water and environmental hygiene. Through activities of the French Development Agency (AFD), France is committed to supporting Vietnam's low carbon and sustainable growth. The two sides welcomed the signing of a Memorandum of Understanding between Vietnam’s Ministry of Natural Resources and Environment and AFD to strengthen cooperation in green growth and response to natural disasters and climate change. Both countries welcomed the long-term partnership between AFD and Vietnamese authorities in development cooperation and encouraged efforts to facilitate the implementation of new programmes and projects. They also welcomed priority projects to prevent coastal erosion and develop infrastructure for four north central coastal provinces. They welcomed the signing of a cooperation agreement on science and technology between the Vietnam Academy of Science and Technology and the French Research Institute for Development. The two sides prioritised science and technology collaboration and agreed to regularly exchange national policies in this field. They affirmed to promote the use of French in Vietnam through the Francophone international organisation and institutions. Vietnam and France reaffirmed the priority of youth exchanges for the development of bilateral relations. They pledged to create more conditions for students to study in the respective societies. The two sides stressed the exemplarity in the countries’ cooperation in tertiary education and research, welcomed the cooperation in law and justice and pledged efforts to implement the cooperation programme for 2018-2019 between the two ministries of justice. They applauded the sound cooperation in health care and pharmaceutical research, along with the agreement on HIV/AIDS and viral hepatitis signed between the Vietnamese Ministry of Health and the French Agency for Research on AIDS and Viral Hepatitis in Hanoi on January 18, 2018. The two leaders considered locality-to-locality ties as a pillar in the bilateral partnership which helps to strengthen connectivity between the two countries and two peoples. Cultural exchange is also a key field in France-Vietnam cooperation, helping to enhance mutual understanding and solidarity between the countries’ people. The two sides reaffirmed the wish to increase the number of tourists between their countries, welcoming the signing of a letter of intent on tourism cooperation between the Vietnamese Ministry of Culture, Sports and Tourism and the French Ministry of Foreign and European Affairs. In the statement, they expressed their belief that the visit will mark a new period in the reinforcement of the Vietnam-France strategic partnership. 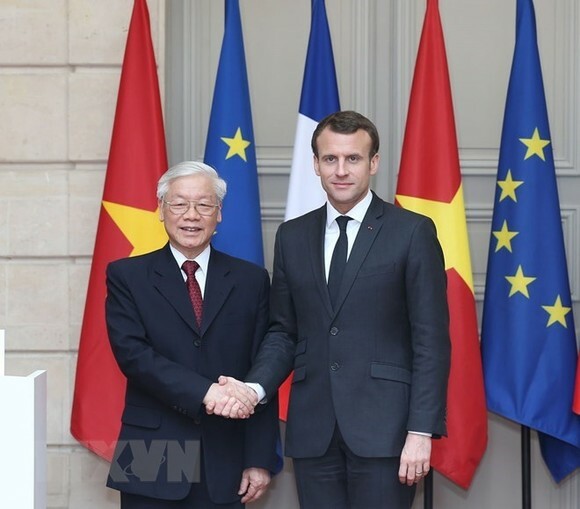 General Secretary Trong invited the French President to visit Vietnam. President Emmanuel Macron accepted the invitation.